- My mum's second best soup recipe! Traditionally Scotch Broth is a bit of everything thrown into the pot and is quite filling. In olden days Scots would eat this as a main meal. In modern times many Scottish households still serve it as a main meal rather than a starter. Ingredients can be substituted depending on your own tastes. It's best made the day before to allow the full flavour to soak through. We make a huge pot of it and boil it up each day, adding more tatties and water as needed. It is very warming when eaten during the winter and is popular on New Year's Day. 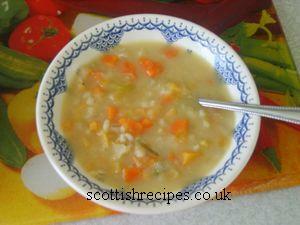 Scots broth soup recipes are sometimes called Barley Broth soup. 3. Melt a wee bit of lard/cooking oil and add the chopped onion. Once softened add the water and meat (you can just add stock rather than boil meat) and boil, skimming off any fatty deposits from the top. 4. After boiling for about half an hour add the barley and peas and simmer for another 30 minutes. 5. Add the remaining vegetables. 6. If used, remove the bone and strip off the meat and return this to the pot. 7. Some people might be tempted to give a dog the bone afterwards. However the boiling of the bone weakens it, making it softer and causing fragments to come off when chewed by an animal. This stock bone could cause mouth ulceration, choking or tears to the lining of the stomach wall from bone fragments and cause dogs pain and discomfort. 8. Add parsley before serving. Great with warmed bread rolls. 9. If making a big pot full it'll keep out provided you boil and stir each day. Though to be safe it would probably best be kept in the fridge or individual portions could be freezed and used as needed. 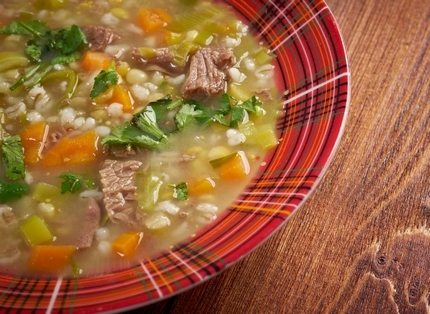 Nick Nairn's New Scottish Cookery has a different Scotch Broth soup recipe which uses shin of beef. The Book Maw Broons Cookbook has a Scottish Broth much like the one above though it includes the use of additional vegetable ingredients such as kail. It was taken from the Housewife Weekly magazine how to make broth soup page. Buy Maw Broon's Cookbook at a discounted price and with free delivery available. The book Scots Cooking: The Best Traditional and Contemporary Scottish Recipes by Sue Lawrence describes it as a health giving dish and compares it to the restorative powers of Jewish chicken soup. The Scotch Broth recipe by Sue Lawrence differs slightly from the one below in that it is much thicker and has different ingredients such as dried marrowfat peas and curly kale.